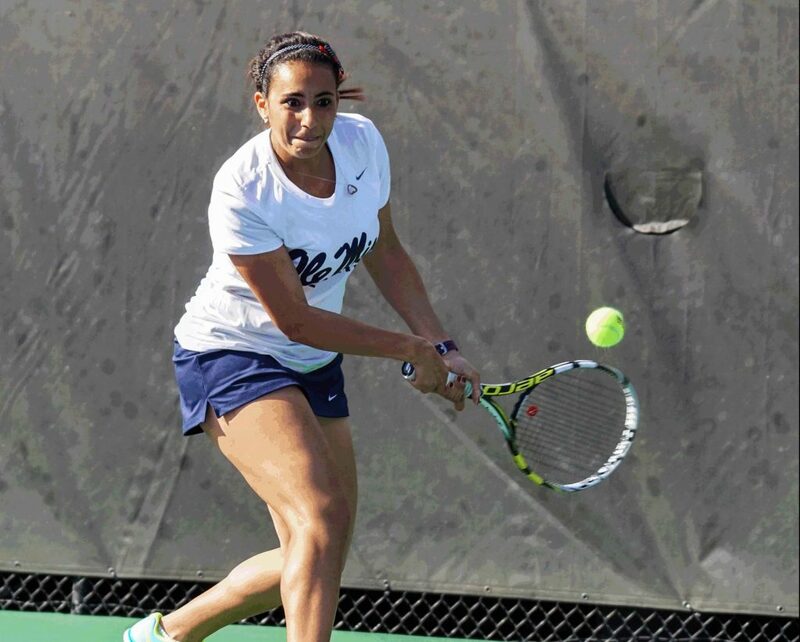 The Ole Miss men’s and women’s tennis teams each have two matches left in the regular season, and they’ll be looking to round into peak form before the SEC and NCAA tournaments. The No. 49 women’s team is coming off a near-upset on the road against then-No. 6 Vanderbilt that they lost 3-4. The Rebels dropped the doubles point to start the match, but they fought back against the 1-0 deficit. Sophomore Sabina Machalova fought through a tight match and a one-set deficit for a 5-7, 7-6, 6-1 win on the No. 1 court. Meanwhile, senior Tea Jandric took the No. 2 court in dramatic fashion with a 7-5, 2-6, 6-3 win over the No. 7 player in the nation, Fernanda Contreras. Despite these wins and a victory from Tereza Janatova, two three-set losses and a sweep on the No. 6 court would prove to be the Rebels downfall. In what was an excellent showing for Ole Miss as the team looks to continue its ascent through the rankings, 5 of the 6 singles courts went to three sets. Jandric and Janatova continued their excellent play on the season. Their wins in the Vanderbilt match pushed their SEC win streaks to six and seven, respectively, and their play has buoyed the Rebels during a tough SEC schedule that contained No. 2 Georgia and No. 5 South Carolina as well as multiple top-30 teams. The men’s team also faced top competition over the weekend. The No. 33 Rebels faced then-No. 6 Mississippi State in Starkville, where they lost 1-6. Senior Filip Kraljevic was a bright spot, as he won both of his matches. He and junior Tim Sandkaulen won their doubles set 6-3, but the Bulldogs took home the doubles point with wins on the other two courts. Kraljevic also won his singles match 5-7, 6-3, 1-0 (10-5) to gain the lone point for the Rebels. The men finished off the weekend with two sweeps of Arkansas Pine-Bluff on Sunday. The Rebels have maintained momentum throughout the past few weeks after tight 4-3 wins over current-No. 17 Georgia and No. 20 Alabama. Sandkaulen has led the way from the No. 1 singles spot with a 10-8 overall record, and he was No. 60 in the latest iteration of the Oracle/ITA Division I Men’s Rankings. Meanwhile, the doubles team of Fabian Fallert and Finn Reynolds has reached as high as No. 31 nationally. The women return home to Oxford to face No. 28 LSU on Friday before their final match at home on Sunday against No. 16 Texas A&M. The men will be on the road for their final two matches. They travel to Baton Rouge, Louisiana, to play No. 36 LSU on Friday before visiting College Station, Texas, to play No. 8 Texas A&M on Sunday.